Ah, the Tiki Hut. Yet another element of the relaxed, tropical, Polynesian, laid-back, island, beach-Tiki Island Life. When one thinks of a Tiki Hut the image that perhaps most often springs to mind is that of a small structure with a thatched roof, likely originally serving as a simple dwelling for early Polynesians. That is probably mostly right. The early Polynesian people had several different living structures, each with meanings assigned them, depending upon purpose. Hale ali’i was the house of the chief and was built on a raised stone foundation in recognition of his high standing. Hale lawai’a was the house of fishing and contained equipment needed for that purpose. Perhaps the structure we might often associate with “Tiki Hut” was the Hale noho. It was a single room structure built as sleeping and living quarters for the Hawaiian family unit. There is another interesting thread of information about Tiki Huts, somewhat unrelated to the Polynesian tradition. This one comes from the Seminole and Miccosukee tribes that were indigenous to Florida. As they were being pursued by American troops in the 1800’s they fled to the relatively impenetrable cover of the Everglades. They recognized the need for shelter that was able to be erected and disassembled quickly, allowing them to remain highly mobile. Essentially of the same construction (cypress logs and palm fronds), these structures were referred to as Chickee Huts (the Seminole word for house). They are indistinguishable from a traditional Tiki Hut, and, in fact, continue to be custom made to this day by the Seminole in Florida as a source of revenue. 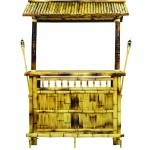 They sell them as Tiki Huts. enhance a tropical-tiki decor. 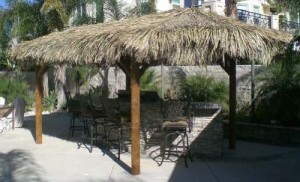 They are for parties, gatherings, luaus and generally experiencing and enjoying “Tikiness.” They are certainly not something I would choose to live in (unless my circumstances changed a lot..), however they would provide a powerful and compelling way to transform your environment and help bring you closer the the tropical ambiance you envision. They obviously require a greater commitment to the whole idea of the Tiki Island lifestyle since a Tiki Hut structure would be significantly more expensive than most of the other items discussed on this site. In addition, while not literally “cast in stone,” they would be items of relative permanence (you wouldn’t move them around party after party). Having said that, a Tiki Hut, especially used in combination with Tiki Sculptures, Tiki Torches and perhaps an assortment of other luau decorations would make an extremely powerful statement, and would certainly help catapult you into your own Tiki Island Life!